Orbital Sciences' second Cygnus spacecraft arrives at NASA's Wallops Flight Facility at Wallops Island, Va., on July 18, 2013. Here, technicians open the container holding the Cygnus Pressurized Cargo Module. 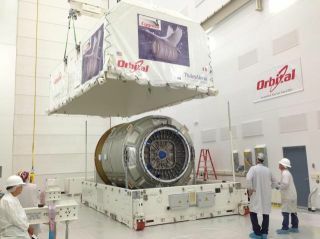 GLASGOW, Scotland — Thales Alenia Space of Italy has delivered the second of nine pressurized cargo-supply modules for the international space station to customer Orbital Sciences Corp.’s Wallops Island, Va., facility, Thales Alenia Space announced July 18. The initial unit was delivered to Orbital in 2011. Dulles, Va.-based Orbital is preparing the launch of the unit, which Orbital calls the Cygnus vehicle, in September aboard an Orbital-built Antares rocket under Orbital’s Commercial Orbital Transportation Services demonstration agreement with NASA. Orbital must complete the demonstration before its cleared to begin making regular cargo runs under an eight-flight, $1.9 billion Commercial Resupply Services contract NASA awarded the company in 2008. An aircraft carrying Orbital Sciences' second Cygnus spacecraft arrives at NASA's Wallops Flight Facility on Wallops Island, Va., on July 18, 2013. Thales Alenia Space said the first four Cygnus modules employ what it calls the standard configuration, which is loaded with up to 2,000 kilograms of cargo for delivery to the space station. The five remaining capsules will use an enhanced configuration that carries up to 2,700 kilograms of cargo.